Due to a variety of circumstances, it has been a month since I’ve checked our roots. 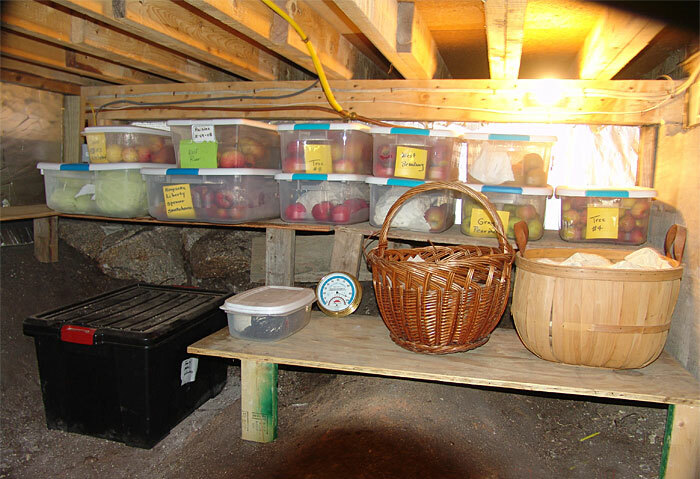 Hundreds of pounds of carrots, turnips, cabbages, rutabegas, daikon, onions, celeraic, parsnips, apples and pears have been “sleeping” in the root cellar. Popping open the trap door in the kitchen, and lowering myself down the ladder into the cellar, I could smell that all was not well. Even with the occasional sub-zero days, temperatures over this past December have still been too warm to maintain a good cellar climate….42 degrees. Not bad…but not great. Roots like it best at just above freezing, say 34 degrees. The red cabbages broke my heart. They obviously came to me with spots of mold and had been stowed in the cellar in just a waxed box…peeling off layers and layers of leaves for the rabbits, I was able to save about 5 heads. The green were much better…not as much rabbit food! Aside from “sprouting” a few leaves, the carrots, turnips and beets still look fine. The pears…well…we should have eaten them. Compost and rabbits. One box of onions …47 pounds… need immediate attention. I emptied the entire box, feeling and sorting for soft spots. Onions will both start to sprout and to mold…these were well on their way. After handling each and every onion, peeling away the layers, I had about 8 pounds of edible flesh. Deglazed the pan with beef stock, and and continued to roast until the mass was broken into sugars…more stock, quick puree…the soup needed just a touch more of sugar, and some depth…looking through the refrigerator, a bottle of Jack’s Organic Ketchup….about ½ cup did the trick. Just enough tomato taste and just the right amount of sweetness! A new use for Jack’s. To serve the soup, heat the oven to 300 degrees. Toast up a piece of bread, place in the bottom of a soup plate, cover with grated cheese, and bake until the cheese is melted and the soup is bubbly.. 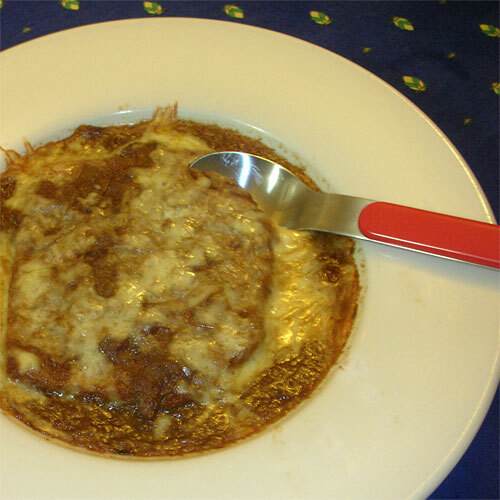 Delicious, Root Cellar French Onion soup…..waste not want not!